How long am I hiding? so the river moults water. And now, another day, almost the last. At the back of my flat is a triangular piece of land, an acre or two, composed mostly of flattened gravel, the drystone used as rail ballast. This area belongs to the railway. On two sides it is bordered by diverging lines; one is the main line that approaches the station, the other is a line used by quarry trains. It goes off to a Mendip quarry which produces crushed stone, a tough Carboniferous limestone. It’s a product required in huge quantities for road-building and also, as it happens, for rail ballast, so here we have crushed stone squeaking along steel levels that are bedded on crushed stone. It could be worse. The East Indian railway of 1856 runs for hundreds of miles on the plundered ruins of medieval Brahminabad and prehistoric Harappā. But perhaps that was just a forward-looking piece of recycling? The structures that are crushed here are quite a lot older, though they were invisible at the low end of the Mendips beneath gently-sloping fields (where the clean layers, undistorted and unweathered, are much better for quarrying). This railway land is officially out of bounds, but it has plenty of human visitors; dog-walkers and BMX bikers, and especially children, above all young teenagers attracted to an unpoliced spot not far from the centre of town where they can get on with the business of growing up without being overlooked. In the rain, however, I am alone; rain converts most places back into wildernesses. Most often when we’re out there the gravel looks like a moonscape, highly inimical to plant growth. You can see extensive areas where ragged webs of dessicated moss are strewn over the ground, and you wonder idly why they’re in one place and not in other. You might also notice curious black flakes of some other indecipherable substance; you would probably just call it dirt. After the heavy April showers all this begins to make sense. You see that the moss lies in very shallow depressions which are now slow-draining swamps. The hyaline tissue in the moss has swollen hugely; this is a moss empire, vividly olive-yellow. The black stuff is now unrecognizable; it has transformed into a vivid green jelly, a mass of lobed and folded algae like seaweed on land. I can’t tell you much more about this; my fondness for mosses far outruns my ability to name them, and there aren’t even any capsules, except on the endlessly proliferous Funaria hygrometrica, that ubiquitous town moss that especially likes the kind of dysfunctional garden that its tenants use solely for burning tyres. This gravel land is, on the whole, a terrible place for plant life. It consists almost entirely of stones grating against each other, with a certain admixture of mineral dust. There is hardly any organic content to the “soil”. Water drains straight through it; or rather, it would do if it weren’t for those undisputed monarchs of the ground, the moss and algae, which greedily bloat with any water that stands around for a few minutes; and after a night of continuous April rain there is, even here, a period when the surface water doesn’t drain through at once. Nearly all the rest of the time this is a desert. The moss makes a virtue of its lack of roots. In its dessicated state it wafts around, gets kicked around and pecked about by birds. The ground is basically dead flat but the moss will tend to end up lodging in any shallow depression, which is just what it wants, because this is where the storm-puddles will happen. The black, brittle algae crumbles and flakes; that’s its own splendidly primitive way of spreading. In the rain each crumb grows like mad. That’s all there is to it. But what really takes my eye is a small group of higher plants that manage to make a living among the moss. These are opportunistic annuals. 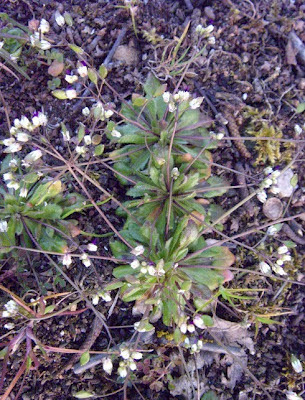 The most characteristic and extreme of them is Erophila verna (Common Whitlowgrass), a true ephemeral. Most of the year it is invisible, surviving only as seeds. It is a common plant on sandy ground, walls, cobbles and other unpromising places. 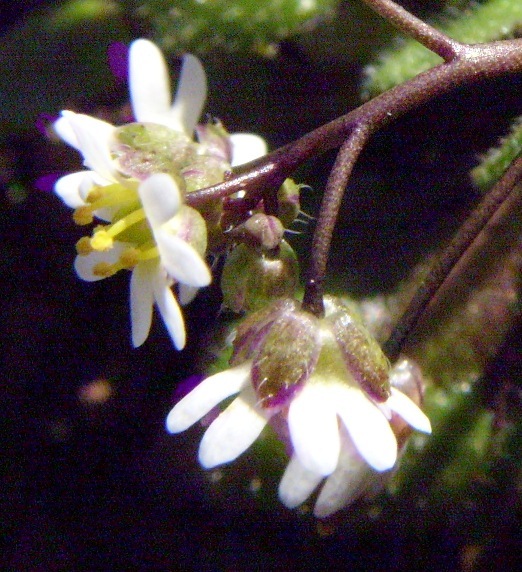 There are two other Erophila species, much less common. They all have the same lifestyle and without inspection look the same as each other, but are actually quite easy to tell apart. 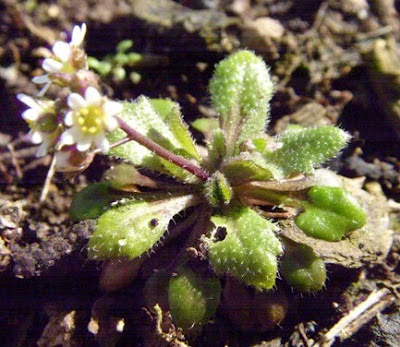 Erophila majuscula is the most pubescent and it has leaf-stalks (petioles) less than half as long as the blades (laminas); Erophila glabrescens is the least pubescent and has petioles about twice as long as the laminas. Erophila verna is intermediate in both these respects, but fortunately it also has the distinctive feature that the petals are split more than half-way down, unlike either of the others (NB this feature has been dismissed by Rich and Lewis as not correlating well). So by gathering a few of the plants and getting busy with a hand-lens, I knew what I was looking at. It’s a very good idea to gather common plants, root and all (though this is illegal in Britain). Fieldwork alone doesn’t give you a close enough feeling for the plant as an individual. This does not mean you dig up rarities or make a collection (what is more futile than a pressed flower?) – but you do want to inspect at leisure; to look, and check, and touch while the plant is still wet and alive. 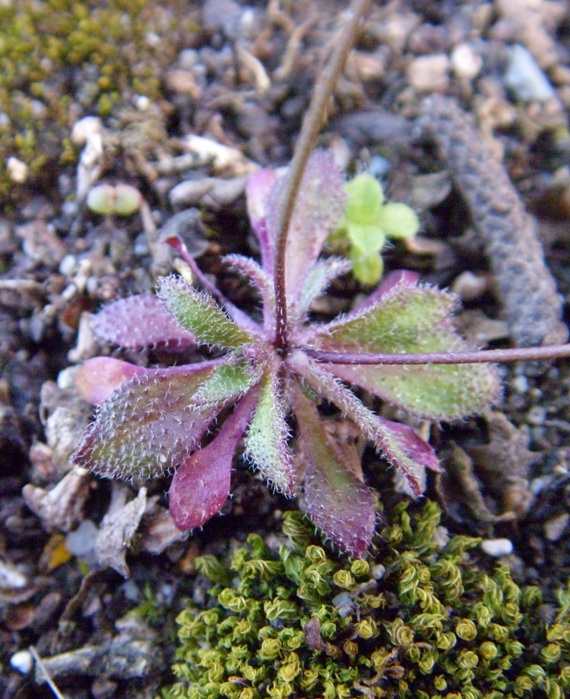 Around the end of December Erophila verna becomes visible, as small neat rosettes of toothed leaves. They are a deep, pure green. 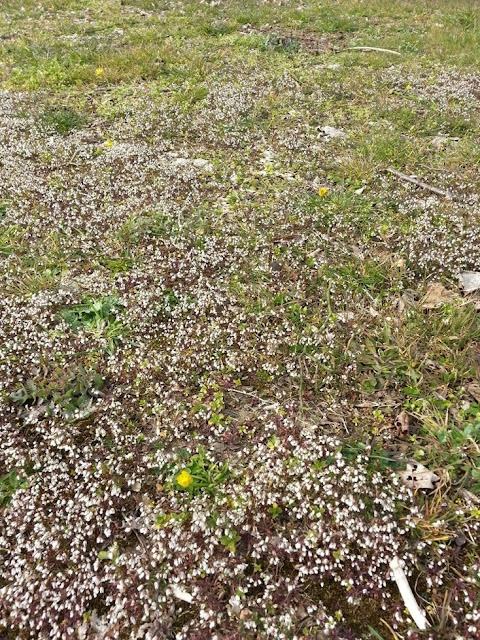 The rosettes hug the ground, and so do the first, unnoticed flowers, in late January. By the end of February they begin flowering on stems that are barely a centimetre high; the flowers look brilliant white, almost like snow (they are, in fact, sometimes under snow). 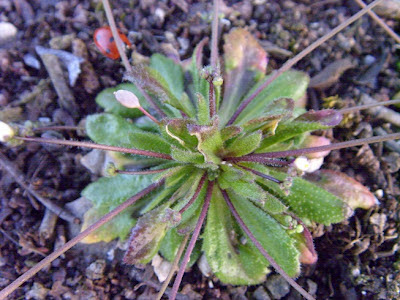 Most annuals are opportunistic and have to be flexible. One way of being opportunistic is to flower at any time of year, like such common weeds as groundsel and red deadnettle. Erophila isn’t like that. It knows that early spring is the time when there’s most likely to be water around, so it is strictly a spring annual. What it doesn’t know, in any given year, is how much water there will be. Cold and frost and dew will ensure a fairly predictable moisture in February, but later it’s much more chancy. So the idea is to flower (and fruit) instantly, without wasting time on growing very much stem, then to carry on growing stems and producing more flowers and fruit if that turns out to be possible. A particularly fortunate individual may have produced half a dozen stems by mid-April, all with flowers. If you examine a plant that looks like it’s almost over, you can see the potential future stems in a curled up state at the centre of the rosette. All the growth of the plant radiates from a single point: all the leaves, the stems and the rather insignificant roots, which begin as a single vertical process of about a centimetre before branching into fibrous laterals. The plant looks like a static thing, but it is actually rather a kinetic display, this explosion from the seed. By April the leaves are no longer green; they have already turned reddish and look rather shrivelled, though new flowers are still being produced. By May the plant is unnoticeable, a wispy skeleton, its papery fruit-cases emptied of their copious tiny seeds. The leaves and roots shrivel away, so the plant frees itself from its anchorage. At the last moment the remaining potential stems extend, using every last piece of remaining nutrient to produce hasty, half-formed flowers and fruits. Two other small annuals grow a couple of yards away. They are less extreme in their life-histories but with basic similarities. 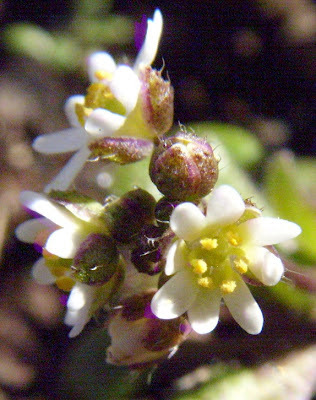 Thale Cress (Arabidopsis thaliana) also springs from a rosette, but it produces only one, strictly vertical stem. It is a relatively robust plant (attaining 20cm) which even has some small stem-leaves, but is no less dedicated to fruiting. The extra structural strength required by this impressive stem is reflected in the root system, which forks early. 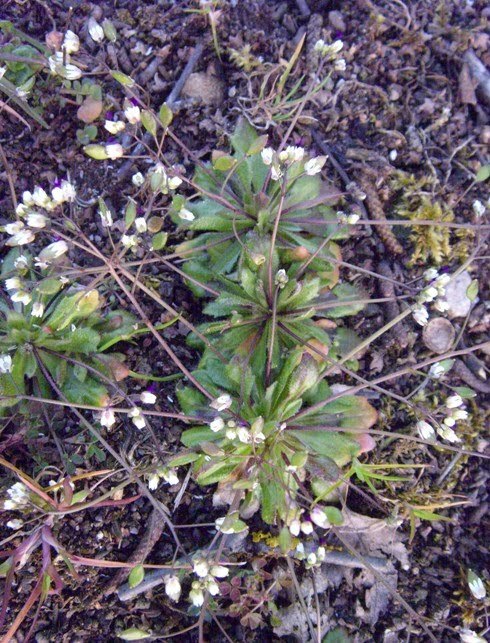 This is the British plant with the lowest chromosome number (2n=10). This is handy for plant geneticists and Thale Cress became, I am sorry to say, a popular choice of victim in the early days of GM experimentation. A scientist friend of mine told me that his students produced glow-in-the-dark thale cress, with the help of a jellyfish. Rue-leaved Saxifrage (Saxifraga tridactylites) is just starting to flower in mid-April. It is clearly adapted to a slightly longer lifetime than Erophila. Its perky succulent leaves are intended to preserve some water through the warmer days of May. The plant has a red stem and all its surfaces above ground are covered in fine hairs tipped with sticky red glands. I first wrote that it's “an attractive little plant”. An experienced reader of plant-books will know from experience what this connotes; it means that the plant is not eye-catching but on inspection reveals a certain neatness and definiteness of form, the opposite of “coarse”; it reminds you of the kind of thing that appeals to horticulturalists. 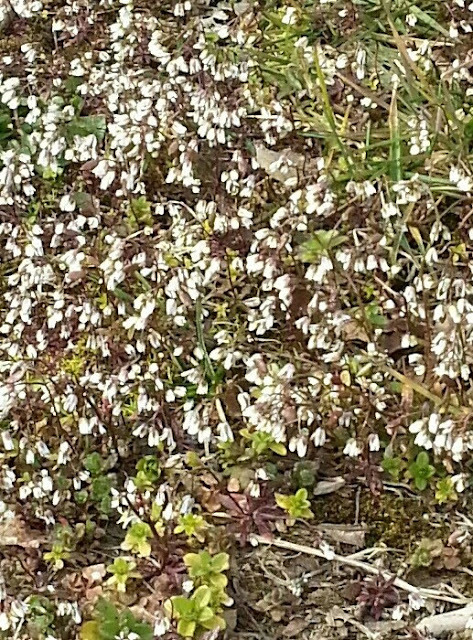 In reality, rue-leaved saxifrage is too small to be noticed casually. And when it is inspected closely, the sense of “attractiveness” is subsumed into a general sense of beauty that is hardly separable from mere apprehension. For then all these plants turn out to beautiful; one is flooded with an intellectual intoxication. It's wonderful to be able to look at things.